Soba noodles are distinctive, earthy tasting Japanese noodles made from buckwheat. Spiral Foods make a wonderful 100 % buckwheat version which is gluten-free, but if you are sensitive to wheat beware when buying soba noodles as many have wheat flour added to them. Cooking soba noodles requires a little extra care: follow the directions given below and you’ll be rewarded with slippery, slightly chewy strands of sesame deliciousness! As with any salad this one is best assembled immediately before serving, but you can prepare everything in advance to make things easy. Add it to a Sunday lunch spread, pack it for a picnic or add an egg or some pan-fried tofu for dinner. Any left over dressing can be stored in the fridge for a few days and used to jazz up Asian style salads and grains. 1. To cook the noodles bring a large saucepan of water to the boil over a high heat. Break the noodles in half and carefully place in the water. When the water returns to the boil add a cup of cold water; repeat this step when the water comes to the boil again. Then simmer vigorously for about 4-5 minutes, until the noodles are ‘al denté’ . Drain and rinse well under cold water then place in a bowl and cover with cold water. 2. To make the dressing put the ingredients in a jar, add the coriander stems and screw the lid on tightly. Shake well to combine. 3. To assemble the salad drain the noodles and add half the dressing. 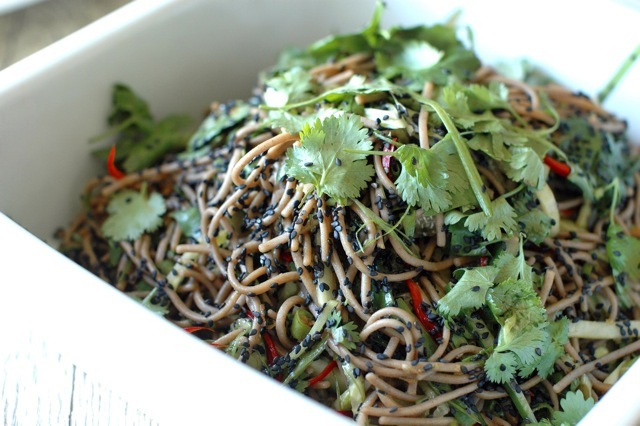 Toss with the cucumber, shallots and chilli and most of the sesame seeds and coriander leaves. Taste and adjust dressing and seasoning. 4. Arrange on a platter or in individual bowls and garnish with remaining sesame seeds and coriander leaves.